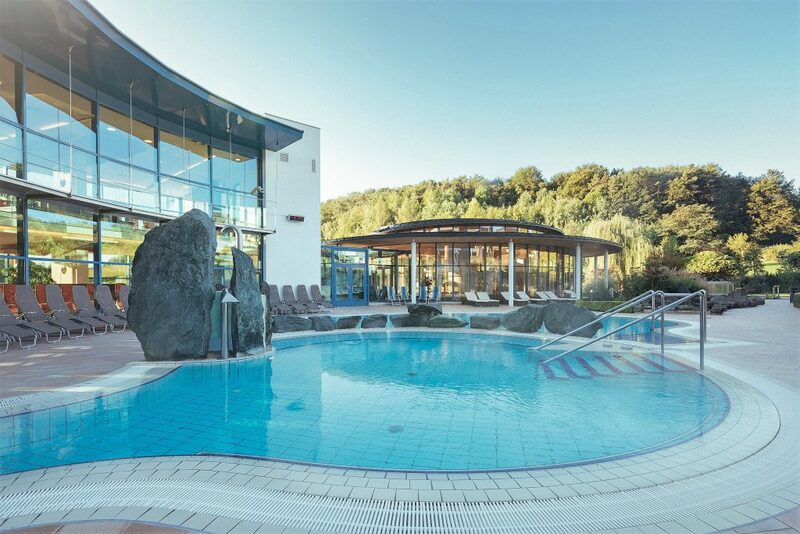 Anyone who has visited Styria knows that the area has a plethora of wellness hotels. Some are the popular ones, others are the impressive ones and there are those which have the character and charm. And here’s one showcasing tons of charm! 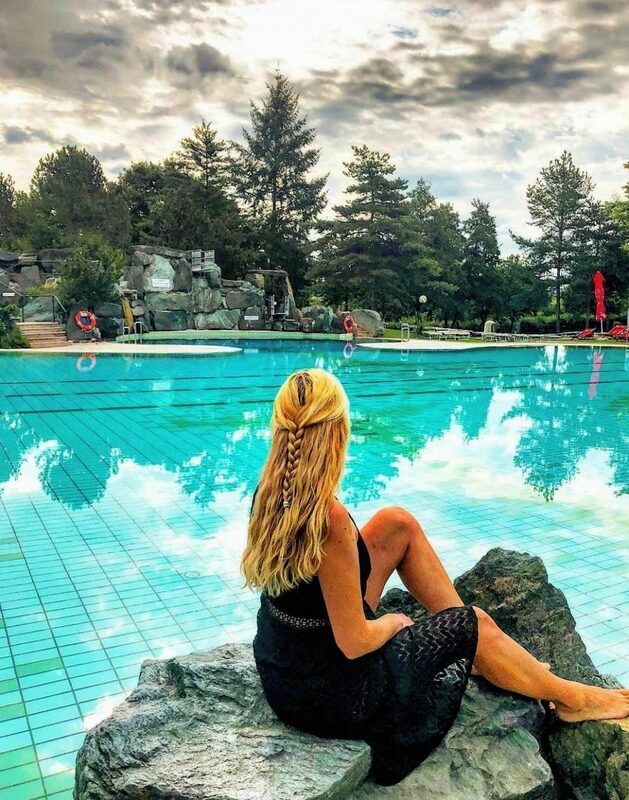 Thermenhotel VIER JAHRESZEITEN is located in peaceful Loipersdorf, also known as the “green” heart of Austria – being the perfect summer and autumn destination for those who want to enjoy the beauty of the landscape, and the fresh air. Besides, this wellness hotel has all the ingredients to restore your mind, body and soul. 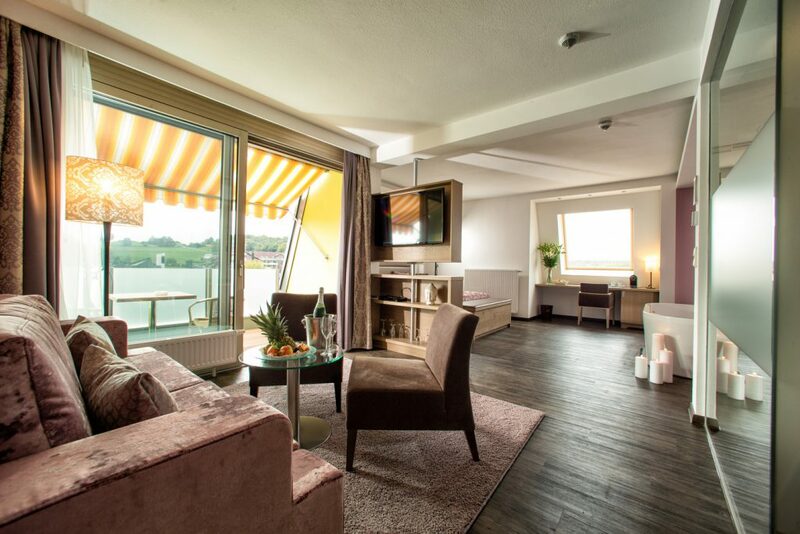 So if this is your idea of a dream weekend break too then keep reading and let me introduce you to Thermenhotel VIER JAHRESZEITEN. 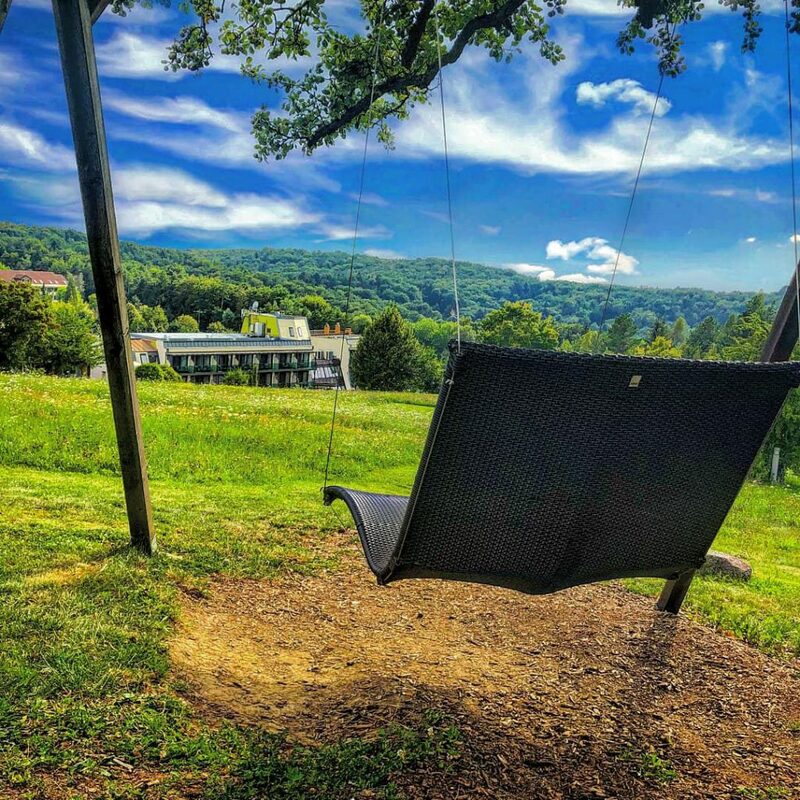 Views to the hotel – rolling hills and tranquil scenery. The guest rooms range across different types of accommodation, featuring indulgent details such as beautiful freestanding bathtubs, modern walk-in showers, comfy beds and Nespresso machines. 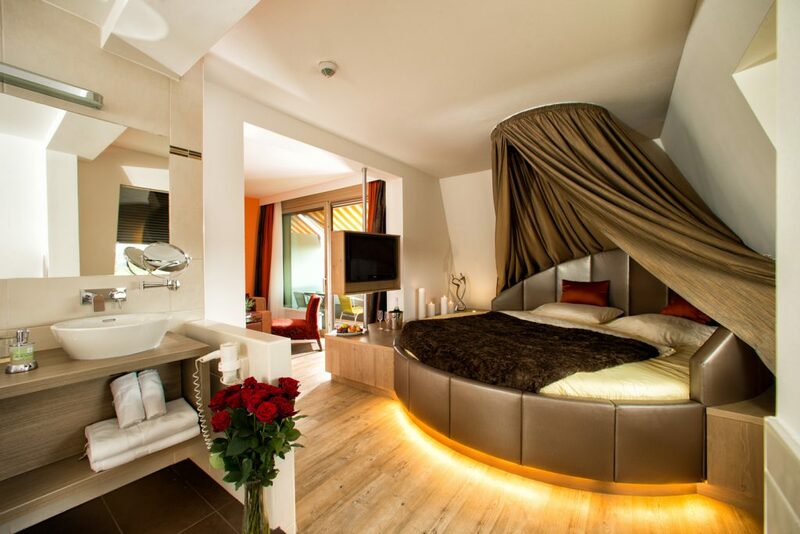 Elegance is the first thing you notice upon entering the generous SUITES. 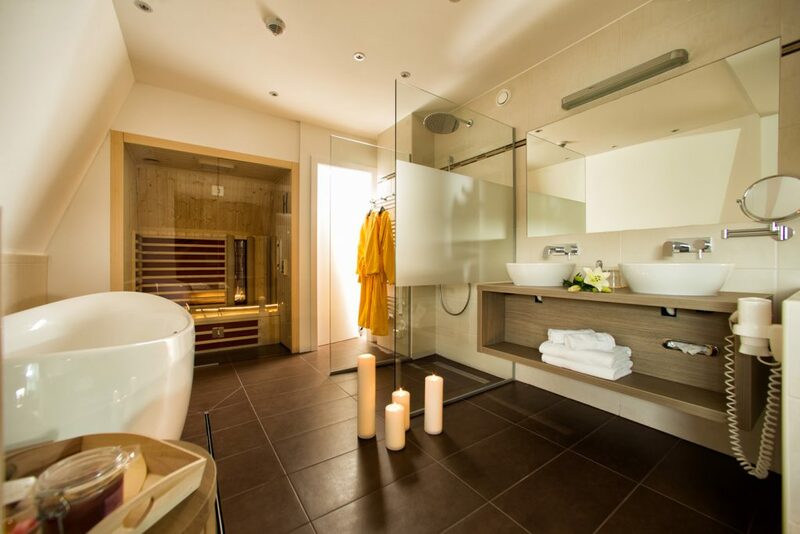 WHAT’S HOT: the huge bathroom with walk-in shower, infrared sauna plus freestanding bathtub. Tempting, right? 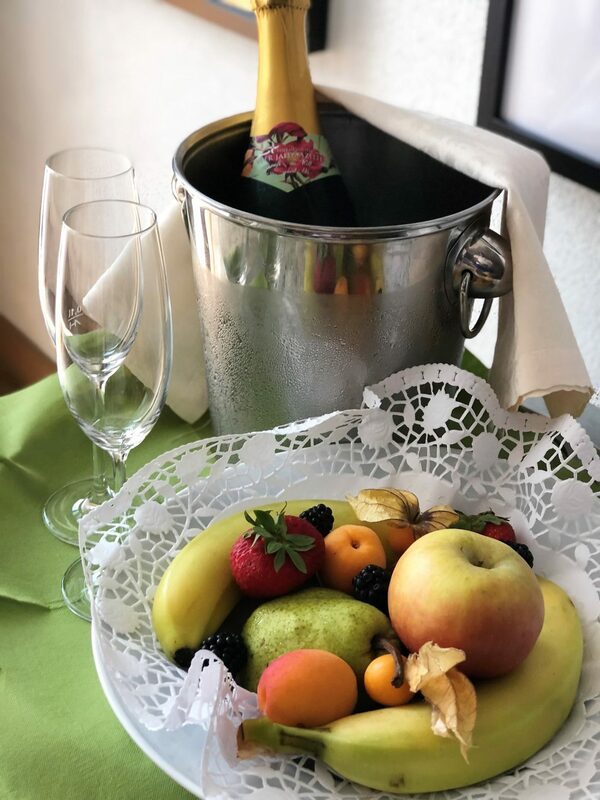 But what makes this charming hotel outshine the rests is its attention to details – candles, flowers, fruits, champagne… Once here, celebrate in style with a chilled bottle of Thermenhotel VIER JAHRESZEITEN Champagne! 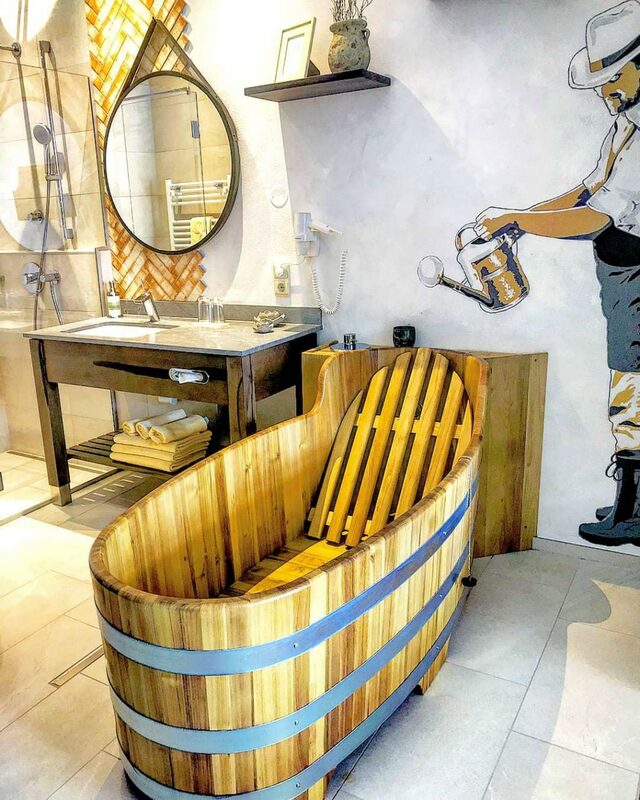 Last but not least, the brand new Garden Rooms boast a freestanding wooden bathtub for the highest demands of a premium SPA culture. Wellness lives here! And so could you! GOOD TO KNOW: your dog is more than welcome at this hotel. Besides, Thermenhotel VIER JAHRESZEITEN also focuses on sustainability as one of its core values, which will make you like it even more. 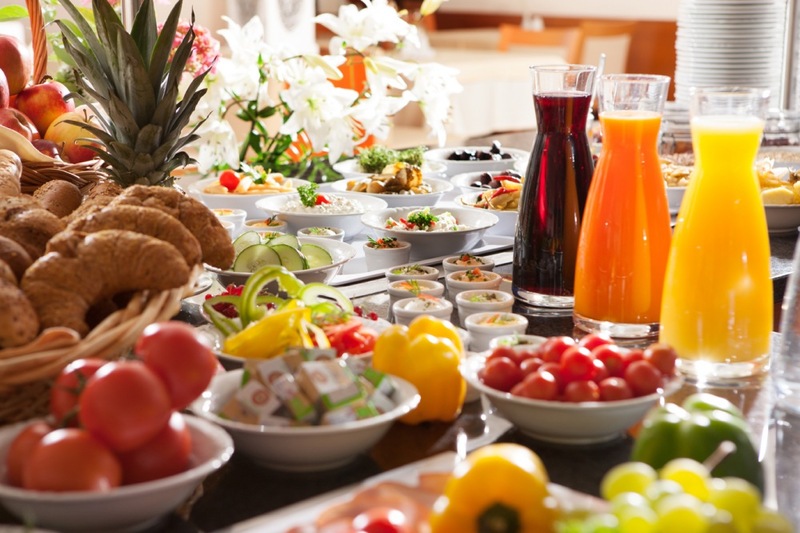 Showcasing healthy cuisine, the wellness hotel hosts 2 restaurants. 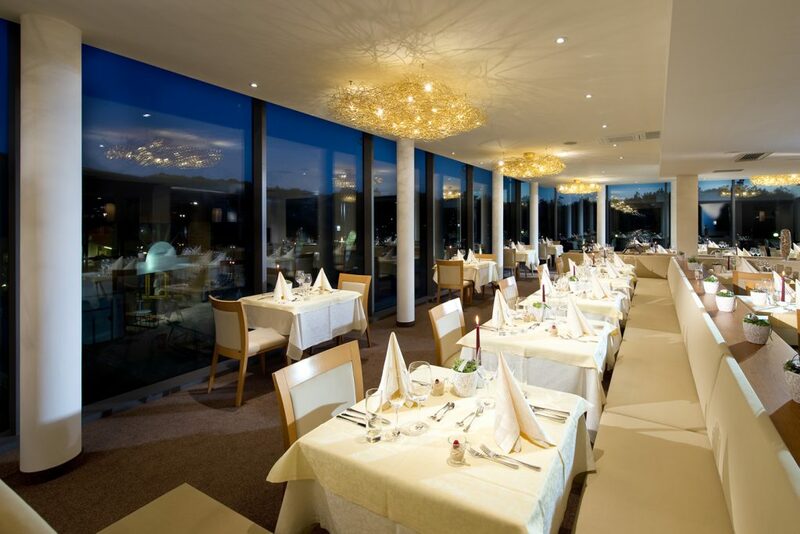 The Panorama Restaurant (serving breakfast plus dinner) boasts beautiful views and a calm ambiance. 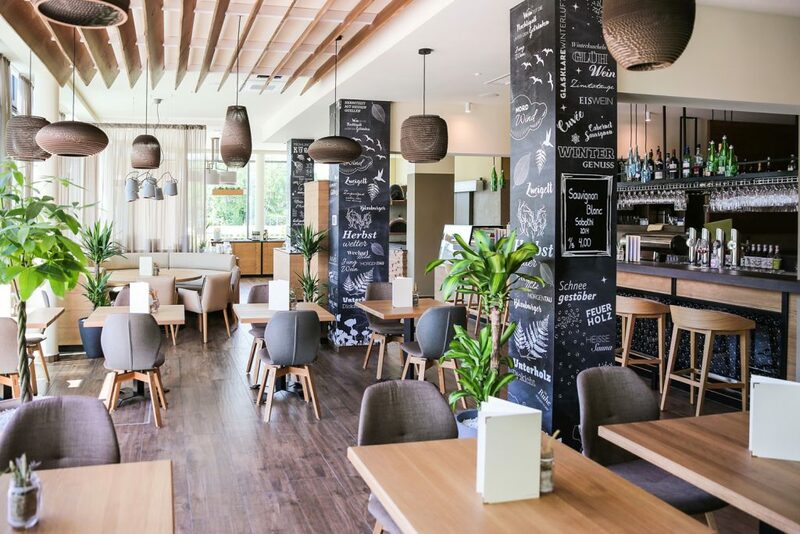 And there is the new á la carte restaurant, Zum Horst, ideal for lunch – here you don’t need to dress up, come relaxed in your bathrobe and slippers directly from the spa. WHAT WE LOVED: the restaurants have a massive selection of certified organic food products. In short, you can expect that there’s something here to satisfy almost every craving and mood. 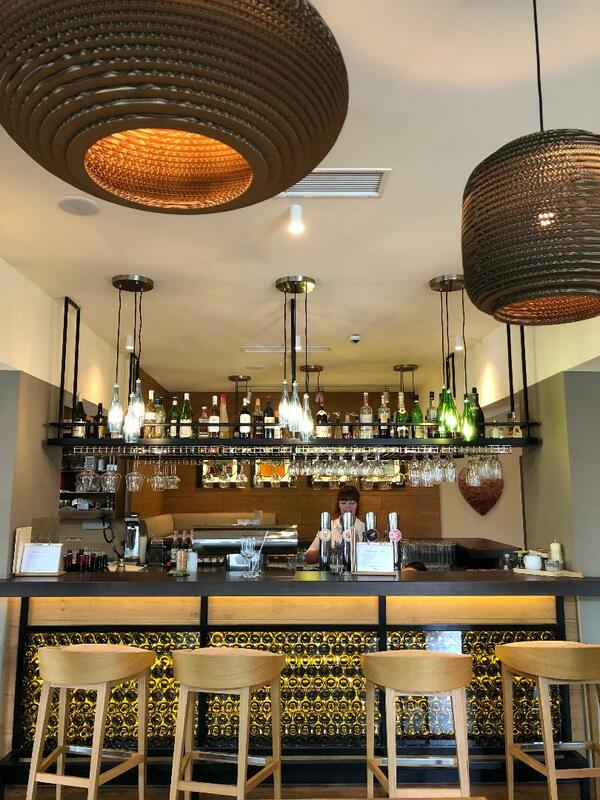 One thing is for sure, you’ll thoroughly enjoy your meals and will be hugely impressed with the service from all the staff. 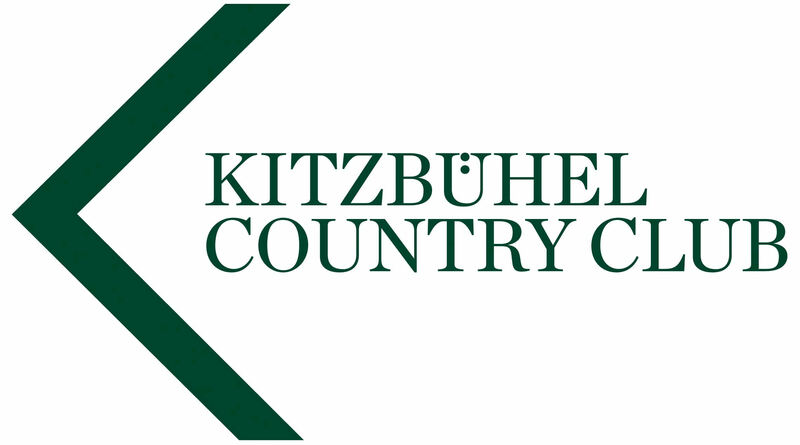 A pleasant atmosphere, professional and attentive waiters are awaiting you. 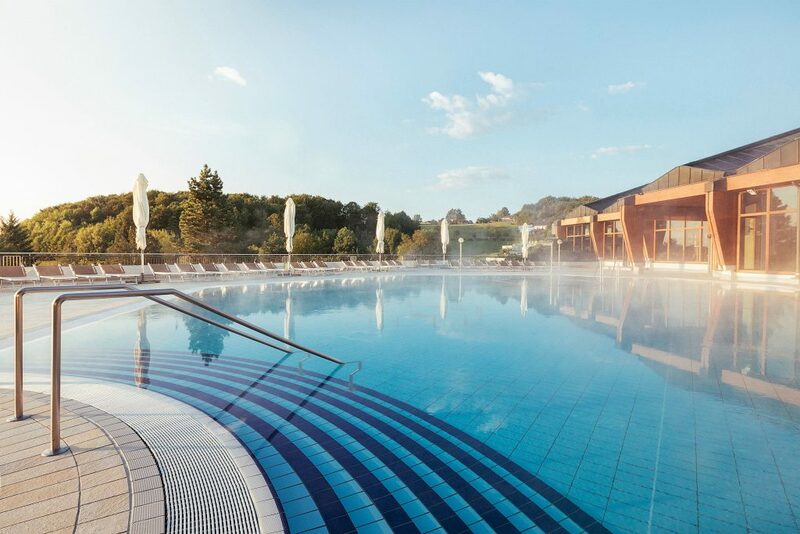 Naturally, Therme Loipersdorf will be a highlight of your stay at Thermenhotel VIER JAHRESZEITEN. Best part? The hotel is directly connected to the SPA via an underground corridor. Spread out across multiple levels both above and below ground, the spa is a labyrinth of pools, saunas, whirlpools, steam rooms and jacuzzis. The motto here is “let go”, “experience”, and “strengthen”. And guess what – that’s ultra easy when you’re in a stellar oasis of calm. Moreover, the FUN PARK is a wonderful experience for kids and adults alike. 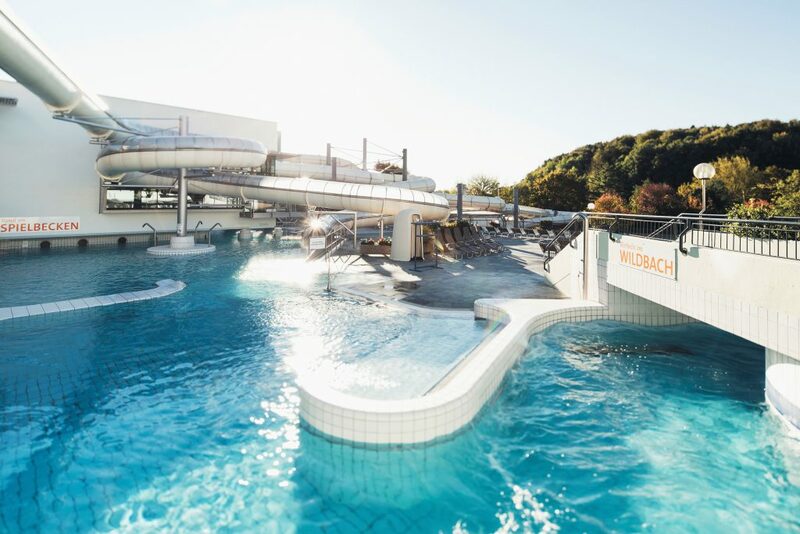 Therme Loipersdorf offers a top notch Kids Programme – lots of water games and splashing activities, all being carefully supervised by the dedicated staff. While kids can keep active with Water Olympics and other fun games, parents can doze by the pool or enjoy a spa treatment. 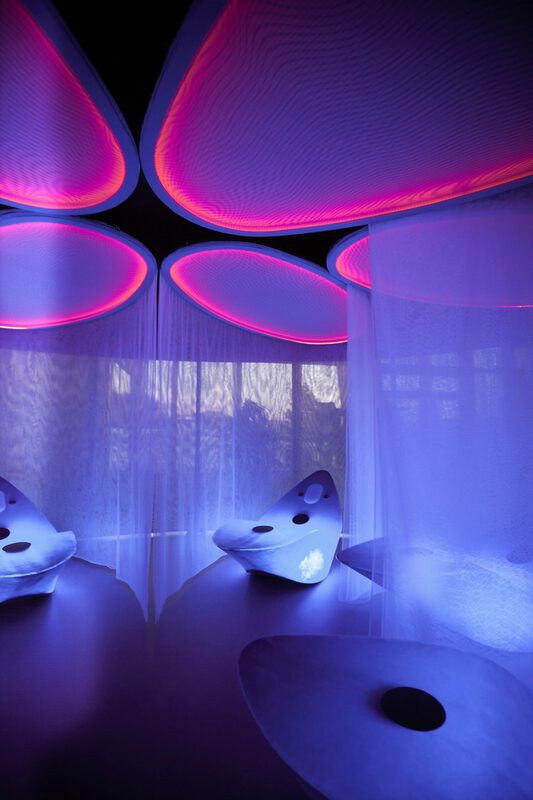 INSIDER TIP: don’t miss the Alpha SPHERE beds – a unique experience providing the deepest relaxation. And there is the Salt GROTTO – made up of 250 million year old salt chunks extracted from the Himalayas. The grotto’s unique micro climate is known for its health-promoting effects – be sure to visit! In short, it’s all about slowing down, and switching off here. And it won’t be long before you fall under the spa’s spell. When the sun hides behind the clouds reflecting over the water, and the world stops for a moment. Well, that’s all for now from Loipersdorf! 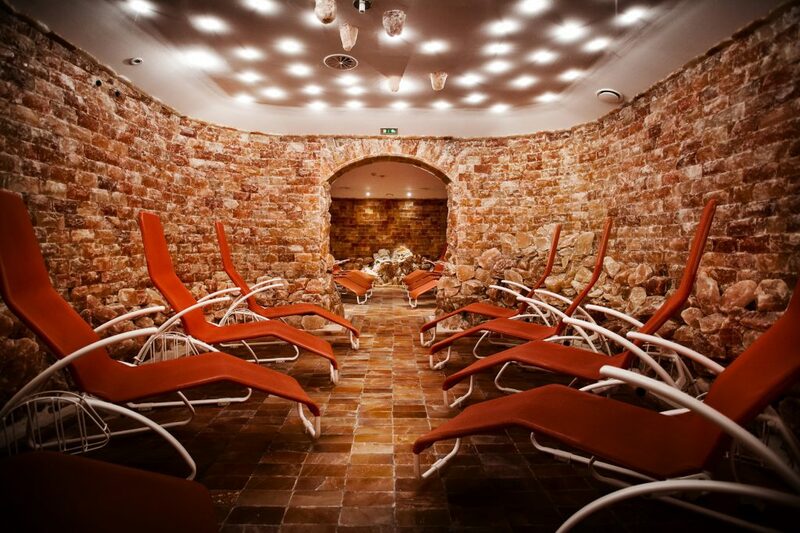 If you’re into thermal waters, relaxation and body treatments, Thermenhotel Vier Jahreszeiten is a must visit. Don’t delay, book your stay here! 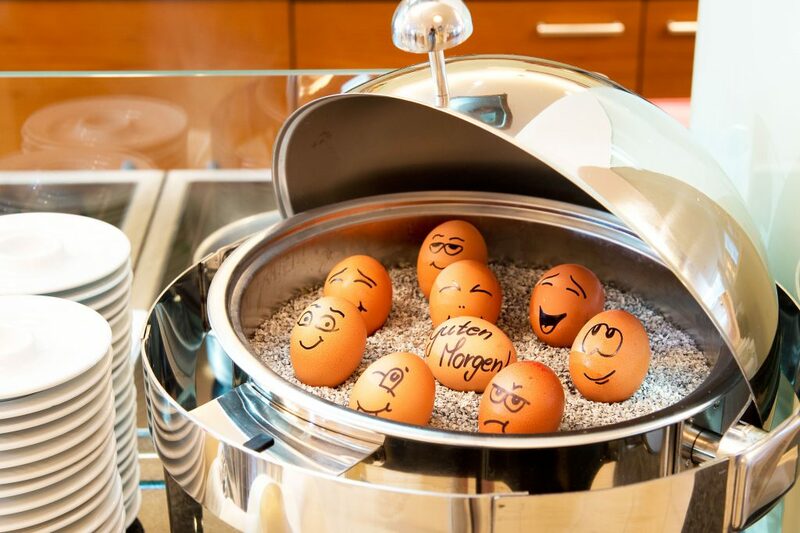 This post has been created in collaboration with Thermenhotel Vier Jahreszeiten Loipersdorf. Opinions, are as always, my own.